Since way back in 1880 newspapers have been full of colour pictures alongside the obligatory headline and necessary paragraphs of copy to tell the story. In fact, it would be pretty hard to ever imagine a newspaper without pictures to illustrate or accompany the news. Press photography innovatively showcases stories with as little as a caption beneath, whether it’s the latest celeb getting ‘papped’ or a current affairs event like conflict being documented; each story is brought to life by a supplementary photo. So, with that comes the importance of photography within a PR remit. Photographs have been used to enhance PR techniques for years. There’s not been a day in most PR careers where any sort of event or announcement hasn’t been accompanied by an image. Not only does the photo add another dimension to the story but it also gives the story a wider appeal. Whilst the news desk might pick the story up, getting the picture desk to choose an image is twice as good – twice the coverage and the chance for added branding. Similarly, a story can be make or break depending on the strength of a photograph so it’s increasingly important for PRs to ensure a good photographer captures press shots that exceed expectations and help to give your story that extra injection to help it hit the headlines. Typically us PRs aren’t experts in taking photographs (just take a look at our Facebook profile uploads), so that’s why we’d always recommend to a client that a professional snapper attends any events or launches that we manage. That said, we do pride ourselves on knowing what makes a good press picture. PRs see several pictures, some great, others not so great, but all in all we understand that just like any other newspaper or magazine editor, that a picture is always what grabs attention on a page. A picture always intrigues the reader in the first place and then helps them digest the story. At Umpf, we recently executed a campaign for one of our clients, Engage Mutual, who sponsor the Super League. Working alongside Leeds Rhinos player, Ryan Hall, we hired a world champion body painter to illustrate the top five injuries sustained in rugby league across five areas of Ryan’s body. Naturally the piece had picture story potential as the body painting element was a great way of showing how the injuries looked ‘inside out’. Initially we were faced with a dull changing room facility where the photos itself weren’t doing the story justice. Having access to a rugby field and the Leeds Rhinos stadium as a backdrop our photographer, from Guzelian, managed to set up a shot that we thought had picture desk appeal as well as news value. The story secured coverage as an exclusive in The Sun as well as full page three picture story leads in The Yorkshire Post and The Yorkshire Evening Post. Of course it was covered in all the rugby league media, too. It was certainly a picture that exceeded our expectations and one that in future campaigns another photograph will have to live up to. Four more examples, below, of fantastic PR photos. 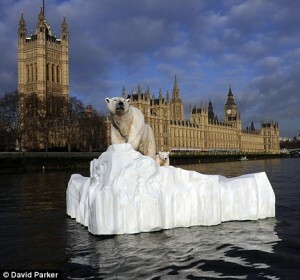 To launch Eden, a new natural history programme, Taylor Herring set up this stunt -with great PR photography to match- which saw a Polar bear floating down the River Thames. Rain Communications staged a horseback fashion show to capture an image that demonstrated excellent fashion in conjunction with the Badminton Horse Trials for client McArthurGlen in Swindon. It bagged some great national coverage as a result. 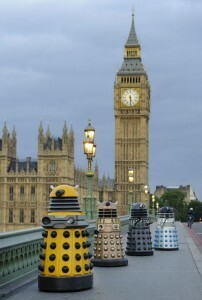 To raise awareness of the Doctor Who experience at Olympia, four Daleks were staged crossing Westminster Bridge. An image with a Big Ben backdrop has got be be a sure fire way of securing the attention of the national press. The engineering firm, Balfour Beatty were behind the PR pictures that graced most nationals throughout this week. The pictures told the story of the Forth Rail Bridge which after a long 10 years has now been successfully repainted. It’s great to see someone endorsing the benefits of creative photography for PR. The key word is creative though. All too often images taken at press events can be unoriginal and obvious, not because the photographer hasn’t got the ability, but simply because they play safe, delivering what they know picture desks will take. As a photographer (with past experience of working in PR), I always look to capture both the picture desk’s ideal shot alongside a series of more creative images. This way, news editors looking for a picture that ‘tells the story’ are happy while the client also has shots which themselves can become newsworthy in their own right. Also, I’d say that a good picture can increase the impact of a release by a factor far greater than two. 80% of communication is visual and the right picture demands attention, intrigues the reader and endures. Hiring the right photographer and then developing a good working relationship with them over the course of time adds real value to campaigns and ongoing marketing and PR activity.